Facing the Stono Inlet, with views of the Kiawah and Stono Rivers on one side and the Atlantic Ocean on the other, this one-of-a-kind retreat on Kiawah Island is a masterpiece of design. Envisioned by the respected architectural firm Shope Reno Wharton of Norwalk, Connecticut, this spectacular estate has been featured widely in leading architectural publications where it was lauded as an oeuvre in custom building for its exquisite craftsmanship. Featuring fine detailing executed by Kiawah master builder Russ Cooper and his team of craftsmen, this graceful structure is covered with weathered red cedar shingle and shake along with handmade Savannah Grey brick. It includes a five-car garage and separate guest quarters with a fitness facility by the pool. The 15,000 square feet main home has an additional 5,000 square feet of outdoor living area in the form of ipe decking, pavilions, porches, balconies, and an infinity pool. 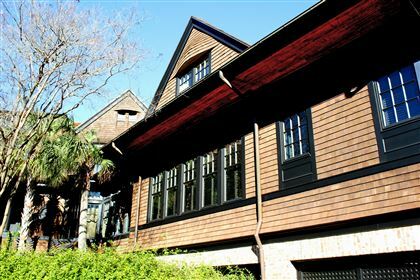 Superb Tischler und Sohn windows from Germany, fenestrated to take advantage of every moment of sunlight, fill each room with the radiance so particular to this romantic sea island, near historic Charleston. Also on the property is a guest house with a full kitchen, fitness and media rooms, a bedroom with sitting area, and two full baths. Click here for additional info.